South Bristol is poorly served for cycling. We’ve been advocating what is now the proposed Filwood Quiteway since our 2013 Bristol Cycling Manifesto (where it was called Q13 Knowle Quietway running all the way into the centre). A lot of work and consultation has been put into planning the details of this route by Sustrans and Bristol Council, including an innovative website for the whole route that we hope to see used again on other schemes. The section through Victoria Park is particularly good and is now a planning application which we strongly support (closing 11th January 2017). It is one of those “win-win” situations. It passes a school and is perfect for encouraging children (and adults) to cycle and walk in safety. Full details are in the Victoria Park Design and Access Statement. Here is our response to the consultation, also below BCyCResponsetoFilwoodQuietway-VictoriaPark. More walking and cycling instead of car use means cleaner air. Bristol has the 4th most polluted air in the UK. Bristolians will be healthier, save money and have a better quality environment. All these benefits will be immediate and long term, for everyone. Despite all these positive benefits there are well organised objectors who are determined to stop this cycleway (here and here). Bristol needs this cycleway. Your support is very important to ensure this proposal proceeds and all the work to date is not wasted. Please show your support by making a comment to the planning application. You just need to give your details, say you support it, and then add a comment, if you wish. This can be as simple as ‘I support this and agree with the more detailed submission by Bristol Cycling Campaign’. There is a useful “You Said, We Did” section on lighting, route choice, segregation, width and barriers on the Filwood Quietway project page. P.S. any number of people from the same household can support, and please ask others to support. Local councillors for Windmill Hill and for Knowle have said they support Space for Cycling, and so has the Cabinet Member for Transport, Mark Bradshaw. You can be sure they are hearing a lot from those who don’t want the cycling improvements. Use this link to send them an email saying you’re in favour. We’ve don’t most of the work but you should include your name and address and personal comments before sending. Bristol Council Corporate Strategy consultation 2017-2022 – good for cycling? 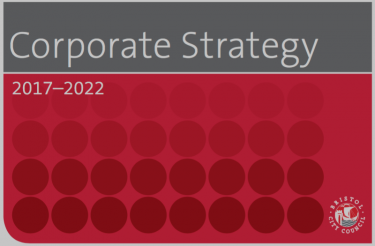 Bristol Council has published the Corporate Strategy consultation 2017-2022. There are immensely hard choices to be made. Traditionally this means that those at the bottom of the pile are hit hardest. In transport terms, this means those who choose the cheapest and healthiest options of walking and cycling. What does the strategy have say about cycling? We need to develop an understanding of where we want the city to be in four years and beyond and ensure we have the council operating in a way that will get us there. […] We have to reinvent the role of Bristol City Council in light of the available finances. It must maintain its leadership role and must continue to fight for good outcomes for people from the city. But we will have to work in new ways. This includes taking a strategic approach to identify what can be done better and more cost effectively. In seeking to tackle congestion, the council needs to work with others to promote public transport use by creating better priority for buses on the road network, by improving the attractiveness of bus travel, especially through integrated ticketing, and by delivering major public transport improvement programmes such as MetroBus and MetroWest rail. The particular geography of the city, with its hills, river crossings and rail lines, as well as its historic road layout, present unique challenges in seeking to improve cross-city connectivity. Money to invest in transport infrastructure is hard to come by and serious thought needs to be given to new ways of generating funding for the future, we have set up a Congestion Task Group and all options will be explored. Encouraging more walking and cycling in a hilly city continues to be a challenge, as indeed does increasing participation in order to promote healthy lifestyles, but we need to build on previous years’ success in securing Government money to invest more in cycle tracks, safe routes and crossings. It is clear that there is no intention to challenge the status quo or find new ways of working. Any change will continue to be expensively and ineffectually bolted on the side based on whatever small pots of funding can be secured. To have delivered on our promise to review residents’ parking schemes and 20mph speed limits with local councillors and be able to respond to community priorities for highway improvements. Delivering a review? Is this progress? To produce a comprehensive Bristol Transport Plan with a particular focus on the steps required to deliver against the key objective of tackling congestion. This could be very useful in setting strategic objectives, if the political will is there. See for example what London has achieved. Develop an air quality action plan. Through the Mayoral Combined Authority, pursue powers to introduce low emission or clean air zones. Another promising objective that could be used to great effect. Currently Neighbourhood Partnerships are given £350k to provide smaller local traffic schemes, which could be removed generating (including staff costs) a £410k saving. Note that delivery of current planned schemes may be impacted. A mixed blessing. Much of the focus of this pot was used for ‘tinkering’ schemes that fiddled at the margins of the main issues. Lots of crossings for example, without considering options for reducing traffic and rat-running. Nevertheless, local schemes can have significant effects. Agree a West of England Joint Spatial Plan and Joint Transport Plan that prioritises investment in the urban area. Another promising objective that could be used to great effect. 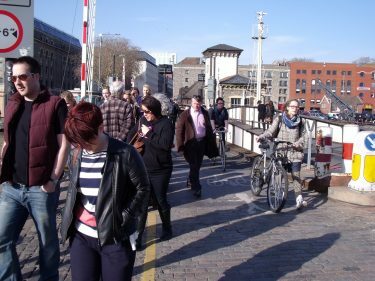 There will also be an Economic Plan for the city centre, and revisions to the Bristol Local Plan that could in theory offer and forward thinking and evidence lead approach to planning for a city ‘where cycling and walking are so easy that everyone does it’ (that’s from the BCyC vision statement in case you don’t recognise it). This is not for defects or larger projects (like proper Space for Cycling routes). The main challenge to making this a useful tool is how to distill and prioritise the very large number of issues being posted. A second issue is that this site is only for Bristol Council. There is no equivalent for South Gloucestershire or the other councils in the area. We’ve added this to our list of useful resources for local actions. Our current funding does not include bigger projects like new pathways, but if you mention these we’ll gather them for future bids. Please note that the Bristol Bugbears website is not monitored for defects in the highway. If you are reporting a street or road defect (e.g. a pothole/poor road surface) please add it directly to the Bristol City Council Street and Road Problem Report Form. Good to see Bristol 24/7 keeping the issue of the future of Prince Street Bridge in the spotlight. Nothing new here however, beyond the consultation over the summer about the protected cycle route. Our view was that the proposed 3m wide two way route wasn’t wide enough, that it gave up at the centre, and that a wholly different and more sensible solution will be possible once it’s decided that people walking and cycling should have proper provision. Sign the petition here. So, this is the replacement for Andrew Gillingham. The model has served London well and made a really significant change to the way cycling is viewed in the rest of the country as well. This role is one we have been calling for since our Bristol Cycling Manifesto in 2013, and again in our Space for Cycling Manifesto for the 2016 elections. With a coming ‘metro mayor’ and sustained transport funding across 3 of the 4 local authorities maybe it time to look at this again to drive through the MetroCycle programme (if and when that emerges).